... 2000 (10 years ago today), in what the BBC called a "relatively peaceful revolution," demonstrators "stormed the Yugoslav parliament building in Belgrade" (right) and "ransacked" the building housing state broadcast channels. (credit for AP photo) The crowds were protesting the intention of Serb President Slobodan Milošević to remain in office after contested elections that many believed his opponent had won. 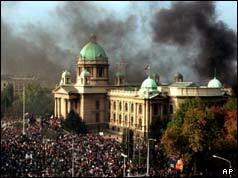 Within a day after these demonstrators, Milošević had resigned from office; within a year, he was transferred to a detention center at The Hague; within 6 years, he had died while still on trial before the International Criminal Tribunal for the former Yugoslavia.